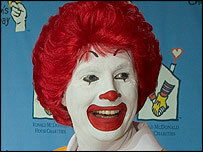 Ronald McDonald, the iconic mascot clown of fast food giant McDonald's, is to be given a sporty new makeover. Traditionally famous for his red hair and yellow jump suit, Ronald will be seen juggling fruit and snowboarding in a TV advert to be screened on Friday. The leaner, more health-conscious Ronald will encourage children to get up and join him playing sports. Images of hamburgers and fries, the food McDonald's is best known for, will be noticeably absent from the campaign. McDonald's said its decision to ditch references to its traditional fast foods in the advert was part of a refocusing of the company's message about food. "We felt it more appropriate to expand the discussion to all foods at this point," said Jeff Carl, McDonald's corporate vice president of global marketing. Ronald McDonald, whose official title within the company is "chief happiness officer", will also be seen riding a skateboard with a basketball star and kicking a football. "He's encouraging children to get up on their feet and start moving. So if he is going to teach this, Ronald has to start moving himself," said Mr Carl. McDonalds, which operates 30,000 restaurants worldwide, has faced growing criticism that its foods are unhealthy and fattening at a time when obesity levels in many countries are soaring. Is the burger giant starting to show its age? The company has already revamped its menu, and now serves salads and fruit alongside hamburgers, fries and milkshakes. But critics said the new McDonald's advert could be misleading for some children. "If they are telling kids to eat vegetables, they should have the food to back that up and they should make it attractive and fun and interesting like the Happy Meals," said Samantha Heller, a clinical nutritionist and exercise physiologist at New York University. Ronald McDonald has been McDonald's official mascot since 1963. He replaced the company's original hamburger mascot 'Speedee'.